Pink faces, green hair, purple fingers, blaring Bollywood music, coloured streets and squeals of laughter all around! Welcome to India’s spring festival – Holi, where vibrant colours explode the air ushering in the psychedelic party called Holi. 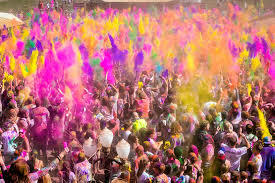 This ‘Festival of Colours’ is best described as a messy street party. All through North, Central and West India streets and neighborhoods are filled with people immersed in water balloon fights, throw of gulal (coloured powder) and splash of water from pichkaris (syringes). Like every other Indian festival, Holi has its roots in Hindu mythology. The word ‘Holi’ has its origin in ‘Holika’ the evil sister of the demon kind Hiranyakashipu. Today Holi is celebrated by all communities, and ages, from kids to elders, among family and friends. The night before the riot of colours begins, the air is filled with the scent of charring wood as bonfires are lit, with people singing and dancing round the fire, symbolising the end of the demoness Holika, and start of the celebrations. The party does not end with just colour throw. 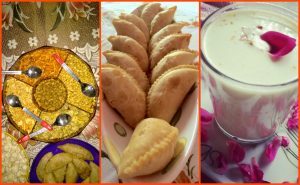 Mithai (traditional sweets) form an integral part of every India festival. Mouth-watering gujiyas (sweet dumplings made of flour and filled with dry fruits), Malpua a pancake like dessert, fried in ghee and dipped in sugar syrup are made at home. Youngsters indulge in drinks of Thandai and Bhang a popular intoxicating drink made of marijuana leaves, leaving them laughing for hours. If you are in India during the month of March, do not miss out on the celebrations. 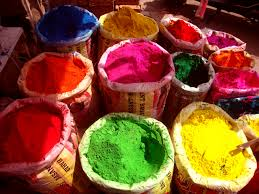 Join in with your Indian friends to play Holi and indulge in a splash of colour and water. There are several Holi parties lined up in hotels and resorts, and you could join in any of them. Do you have exciting stories about Holi? Share your experiences, we would love to read about the fun time you had playing Holi in India ? Previous Post:What a Moroccan Tour Guide taught me about Pursuing my Happiness !